Chalcid wasps (/ˈkælsɪd/, from Greek khalkos, meaning 'copper', for their metallic colour) are insects within the superfamily Chalcidoidea, part of the order Hymenoptera. The superfamily contains some 22,500 known species, and an estimated total diversity of more than 500,000 species, meaning the vast majority have yet to be discovered and described. 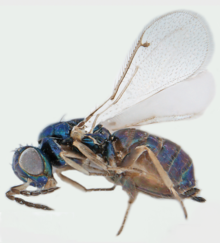 The name "chalcid" is often confused with the name "chalcidid", though the latter refers strictly to one constituent family, the Chalcididae, rather than the superfamily as a whole; accordingly, most recent publications (e.g.,) use the name "chalcidoid" when referring to members of the superfamily. Most of the species are parasitoids of other insects, attacking the egg or larval stage of their host, though many other life cycles are known. These hosts are to be found in at least 12 different insect orders including Lepidoptera (butterflies and moths), Diptera (true flies), Coleoptera (beetles), Hemiptera (true bugs), and other Hymenoptera, as well as two orders of Arachnida, and even one family of nematodes. For example, the chalcid fly is responsible for a small percentage of egg death in the wood white butterfly (L. sinapis). When the host is itself a parasitoid, they are referred to as hyperparasitoids. A small percentage are phytophagous and the larvae feed inside seeds, stems, and galls, including some that act as pollinators (e.g. fig wasps). Generally beneficial to humans as a group, chalcidoids help keep various crop pests under control, and many species have been imported as biocontrol agents. Moth parasitoid Copidosoma floridanum is one such species, whose genome is being sequenced by the Human Genome Sequencing Center as part of the i5K project, which aims to sequence the genomes of 5,000 arthropods. Chalcidoids are tiny, dark-coloured wasps, typically black or brown, but often metallic blue or green, with complex sculpturing on the body. They are also recognized by the characteristic reduced wing venation, similar to that seen in other superfamilies of parasitoid wasps. Chalcidoidea is a superfamily of Hymenoptera, whose family constituency is in constant flux, as new hypotheses of relationships are constantly being proposed and rejected; with the advent of molecular systematics, it seems that the future will see further revisions of the classification in use today. Of these families, at least five are known to be artificial groups (paraphyletic), and are being - or will be - divided into several families, or perhaps fused with existing families. The most problematic, the Pteromalidae, is, in some classifications, supposed to contain as many as eight independent lineages, grouped together because of superficial similarities. Gibson, G. A. P., Huber, J. T., and J. B. Woolley. 1997. Annotated keys to the genera of Nearctic Chalcidoidea (Hymenoptera). NRC Research Press. ^ "Chalcid". The American Heritage Dictionary of the English Language (4th ed.). Houghton Mifflin Company. 2009. Retrieved 3 September 2013. ^ a b Heraty, John M.; Burks, Roger A.; Cruaud, Astrid; Gibson, Gary A. P.; Liljeblad, Johan; Munro, James; Rasplus, Jean-Yves; Delvare, Gerard; Janšta, Peter; Gumovsky, Alex; Huber, John; Woolley, James B.; Krogmann, Lars; Heydon, Steve; Polaszek, Andrew; Schmidt, Stefan; Darling, D. Chris; Gates, Michael W.; Mottern, Jason; Murray, Elizabeth; Dal Molin, Ana; Triapitsyn, Serguei; Baur, Hannes; Pinto, John D.; van Noort, Simon; George, Jeremiah; Yoder, Matthew (2013). "A phylogenetic analysis of the megadiverse Chalcidoidea (Hymenoptera)". Cladistics. 29 (5): 466–542. doi:10.1111/cla.12006. ^ Warren, M.S. and Bourne, N.A.D. (1998). "Wood White (Leptidea sinapis)". Butterfly Conservation Project. Wikimedia Commons has media related to Chalcidoidea. This page was last edited on 1 February 2019, at 13:58 (UTC).